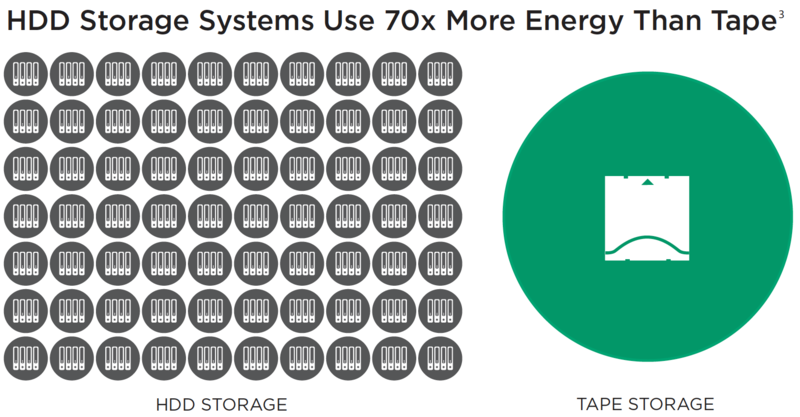 With energy consumption of stored data growing exponentially year-over-year, many organizations are looking for technologies to reduce the carbon footprint of storing their data and many are turning to tape technology for that solution. Studies show that even slightly shifting the ratio between disk and tape technology, on a global level, could save hundreds of millions of metric tons of CO2 emissions year-over-year! With this in mind many organizations are moving rarely accessed data to tape technology, in order to significantly reduce the amount of data-storage carbon emissions without sacrificing the integrity of its stored information. Additionally, energy costs money, and the cost per terabyte of tape storage is considerably less than all other types of digital storage, making the shift to tape appealing to both save substantial carbon emissions and save substantial money. In analyzing the total cost of ownership of digital storage, tape is also the most cost effective way to archive data, beating both cloud and disk in cost per terabyte per month. As companies seek to achieve carbon emissions reduction targets, many are undertaking expensive adjustments within their supply chains. Data storage, a part of every organization’s strategic infrastructure, may provide an easy path that will contribute to emission reduction initiatives – while saving money at the same time! 1. Total HDD usage data, Statistica.com (2.6 Billion / 15 Watts ea.) World energy consumption from Organization for Economic Development and Cooperation. 2. The Organization for Co-operation and Development estimates world electricity consumption per year at 20,000 terawatt hours, or 20 billion megawatt hours. (Note: New York City uses 11,000 MWH per day). 3. Analysis of published energy consumption. IBM TS3500 (3 PB/ 6 drive system) / Isilon Archive appliance (240TB).